Alveolar epithelial type II cells, a major source of angiotensin-converting enzyme (ACE)-2 in the adult lung, are normally quiescent but actively proliferate in lung fibrosis and downregulate this protective enzyme. It was, therefore, hypothesised that ACE-2 expression might be related to cell cycle progression. To test this hypothesis, ACE-2 mRNA levels, protein levels and enzymatic activity were examined in fibrotic human lungs and in the alveolar epithelial cell lines A549 and MLE-12 studied at postconfluent (quiescent) versus subconfluent (proliferating) densities. ACE-2 mRNA, immunoreactive protein and enzymatic activity were all high in quiescent cells, but were severely downregulated or absent in actively proliferating cells. Upregulation of the enzyme in cells that were progressing to quiescence was completely inhibited by the transcription blocker actinomycin D or by SP600125, an inhibitor of c-Jun N-terminal kinase (JNK). In lung biopsy specimens obtained from patients with idiopathic pulmonary fibrosis, immunoreactive enzyme was absent in alveolar epithelia that were positive for proliferation markers, but was robustly expressed in alveolar epithelia devoid of proliferation markers. These data explain the loss of ACE-2 in lung fibrosis and demonstrate cell cycle-dependent regulation of this protective enzyme by a JNK-mediated transcriptional mechanism. A variety of investigations support the contention that a local tissue angiotensin (ANG) system is critical in the pathogenesis of pulmonary fibrosis in both animal models [1, 2] and in idiopathic pulmonary fibrosis (IPF) [3, 4], the most frequent and insidious interstitial lung disease (ILD) encountered by pulmonary physicians. Several lines of evidence point to a critical role for ANGII in the signalling of cellular and molecular events believed to be critical in the pathogenesis of lung fibrosis, including alveolar epithelial cell (AEC) apoptosis , fibroblast proliferation and migration [6, 7] and collagen synthesis . The induction of apoptosis in cultured AECs in response to a variety of proapoptotic and profibrotic stimuli [9–12] has been shown to both activate and require the synthesis of angiotensinogen (AGT) and the processed peptide ANGII, the effector peptide of this system. ANGII is both motogenic  and mitogenic  for human lung fibroblasts, and increases collagen synthesis through a mechanism that is mediated by autocrine transactivation of transforming growth factor (TGF)-β1 in the fibroblast itself . TGF-β1 transactivation in turn stimulates procollagen synthesis and the myofibroblast transition [13, 14], in addition to activating AGT expression in an apparent autocrine loop . Reductions in lung fibrogenesis by ANG receptor AT1 blockers in mice or rats [1, 15] or AT1 receptor deletion in mice  support the contention that the mechanisms just discussed are active in vivo as well as in the in vitro systems in which they were first identified. Evidence from our laboratory supports an important role in lung fibrosis for the counterregulatory axis composed of angiotensin-converting enzyme (ACE)-2, its product ANG1-7 and the ANG1-7 receptor mas . In the bleomycin model of lung fibrosis in mice or rats, ACE-2 was shown to be protective through the use of small interfering RNA (siRNA) knockdown or competitive inhibition of ACE-2 with the peptide DX600, either of which exacerbated collagen deposition in response to bleomycin . Other authors have shown a similar protective role for ACE-2 in lung fibrosis induced by monocrotaline . By contrast, administration of purified recombinant ACE-2 inhibited bleomycin-induced collagen deposition . In a recent study of the regulation of apoptosis in cultured AECs, ACE-2 and its product ANG1-7 were found to protect against AEC death through the ability of ANG1-7 to reduce c-Jun N-terminal kinase (JNK) phosphorylation, an event required for the signalling of AEC apoptosis in response to ANGII and other proapoptotic inducers . The inhibitory effect of ANG1-7 on AEC death was mediated by the ANG1-7 receptor mas. These results, together with those showing inhibition of collagen deposition discussed in the preceding paragraph, demonstrate the antiapoptotic and antifibrotic roles of the ACE-2/ANG1-7/mas axis in experimental pulmonary fibrosis. An important finding in the study by Li et al. was the demonstration that the protective enzyme ACE-2 was downregulated in both experimental and human lung fibrosis. In human lung tissue obtained by biopsy from patients with IPF, ACE-2 was reduced at the level of mRNA, immunoreactive protein and enzymatic activity, all of which were reduced to a similar severe degree. Likewise, ACE-2 protein, enzymatic activity and mRNA were also reduced in bleomycin-induced mouse and rat models of IPF, but no reduction was seen in ACE-2 mRNA in cultured AECs exposed to bleomycin in vitro. For this reason, we sought to find a mechanism that could explain the loss of ACE-2 mRNA, protein and activity in fibrotic human lungs that were never exposed to bleomyin or other xenobiotic inducers of apoptosis. For many years the alveolar epithelium of the fibrotic human lung has been described as the “hyperplastic” or “cuboidal” epithelium, based on the observation of predominantly type II pneumocytes that are proliferating in response to ongoing epithelial injury [17, 18]. In contrast, the alveolar epithelium of normal lung is essentially quiescent, with few or no proliferating cells and numerous type I cells, the terminally differentiated progeny of type II cells . On this basis, it was hypothesised that the decrease in ACE-2 observed in fibrotic human lungs  might be a consequence of cell cycle progression by type II pneumocytes. We report here the finding that ACE-2 mRNA, immunoreactive protein and enzymatic activity are all highly expressed in AECs that are quiescent, but are downregulated in AECs that have entered the cell cycle. We also report evidence that the upregulation of ACE-2 that accompanies the progression of AECs to quiescence is transcriptionally regulated by a mechanism mediated by JNK. The fluorogenic peptide substrate MCA-YVADAPK(Dnp)-OH and purified human recombinant ACE-2 were obtained from R&D Systems (Minneapolis, MN, USA). The peptide DX600 was synthesized by the Macromolecular Structure Facility (Dept of Biochemistry, Michigan State University, East Lansing, MI, USA). Antibodies against ACE-2 and the anticytokeratin antibody MNF-116 were obtained from Abcam (Cambridge, MA, USA). Antibodies against proliferating cell nuclear antigen (PCNA) and bromodeoxyuridine (BrdU) were purchased from BD Biosciences (San Diego, CA, USA). Actinomycin D and SP600125 were purchased from Sigma-Aldrich (St Louis, MO, USA). SB203580 was obtained from Cell Signaling Technology Inc. (Danvers, MA, USA) and PD98059 was purchased from Invitrogen (Grand Island, NY, USA). Primers for reverse transcriptase PCR (RT-PCR) of ACE-2 were purchased from Santa Cruz Biotechnology Inc. (Santa Cruz, CA, USA). All other materials were of reagent grade. The human lung adenocarcinoma cell line A549 was obtained from the American Type Cell Culture Collection and cultured in Ham's F12 medium supplemented with 10% fetal bovine serum (FBS). The mouse lung epithelial cell line MLE-12, a kind gift from the laboratory of J. Whitsett (University of Cincinnati, Cincinnati, OH, USA), was grown in complete HITES media supplemented with 5% FBS. All experiments were performed in the presence of serum regardless of the cell density. Subconfluent cells were harvested at 60–75% confluence, and postconfluent cells were harvested at 5 days postconfluence unless noted otherwise. Human lung tissue was obtained by video-assisted thoracoscopic lung surgery performed at Thorax Clínic Direction, University Hospital of Bellvitge, l’Hospitalet de Llobregat, Spain. Fibrotic lung tissue was obtained from 14 patients with IPF; biopsies were obtained from more than one lung lobe. All patients had clinical, functional, radiological and histological features that fulfil the diagnostic criteria for IPF . Two different expert radiologists and pathologists evaluated high-resolution tomography scan images and the histological pattern of the lung section, respectively. Patients had neither antecedents of any occupational or environmental exposure nor any other known cause of ILD. The multidisciplinary committee of ILDs evaluated all cases. None of these IPF patients had received steroids or other immunosuppressant therapy at the time of lung sample collection. Normal human lung tissue was obtained from seven individuals undergoing surgical treatment for spontaneous pneumothorax with no history of pulmonary disease. No histopathological evidence of disease was found in these tissue samples. Written informed consent was obtained from the patients according to institutional guidelines, and the study was approved by the Ethics Committee of University Hospital of Bellvitge. All tissue was fixed in 10% neutral buffered formalin for 16 h and embedded in paraffin. Sections were cut at 4.0 μm thickness and mounted on glass coverslips. Total RNA was extracted from human lung biopsies or frozen mouse lung with Trizol Reagent (Invitrogen) according to the manufacturer's instructions. First-strand cDNA was synthesised from 2 μg of total RNA with Superscript II reverse transcriptase (Invitrogen) and oligo (dT)12–18. Real-time RT-PCR was carried out with cDNA synthesised from 50 ng of total RNA, SYBR Green PCR core reagents (Applied Biosystems, Foster City, CA, USA) according to the manufacturer's protocol, and 0.2 μM specific primers for human ACE-2 (sense 5'-CATTGGAGCAAGTGTTGGATCTT-3' and antisense 5'-GAGCTAATGCATGCCATTCTCA-3') and β-actin (sense 5'-AGGCCAACCGCGAGAAGATGACC-3' and antisense 5'-GAAGTCCAGGGCGACGTAGC-3'). For mouse ACE-2, the primers were: sense 5'-GGATACCTACCCTTCCTACATCAGC-3' and antisense 5'-CTACCC CACATATCACCAAGCA-3'. For mouse β-actin, the primers were: sense 5'-TCCTGTGGCATCCATGAAACT-3' and antisense 5'-CTTCGTGAACGCCACGTGCTA-3'. The PCR thermal profile started with 10 min activation of Taq polymerase at 95°C followed by 40 cycles of denaturation at 94°C for 60 s, annealing at 55°C for 60 s, and extension at 72°C for 60 s, ending with dissociation curve analysis to validate the specificity of the PCR products. Reactions were performed in a Mx3000P machine (Stratagene, La Jolla, CA, USA) and threshold cycle (Ct) data were collected with MxPro-Mx3000P software version 3.0 (Stratagene). The relative ACE-2 expression was normalised to β-actin and calculated with the comparative Ct method of 2−ΔΔCt. In all figures, the mean value for the ACE-2/β-actin ratio in the control group was set to 100%, and was expressed relative to the ACE-2/β-actin ratio for the treatment group. Human or mouse lung epithelial cells were homogenised in ice-cold NP40-based lysis buffer, supplemented with protease inhibitor (Protease Inhibitor Cocktail P840; Sigma-Aldrich). Soluble protein extracts (20 μg) were loaded and run on 10% Tris-HCl polyacrylamide gels, separated by SDS-PAGE, in 10× Tris/Glycine/SDS buffer (Bio-Rad, Hercules, CA, USA). Gels were transferred to Immun-blot PVDF blotting membrane (Bio-Rad) in Towbin buffer. The blotting membrane was blocked by 5% nonfat dry milk in 0.1% Tween 20 in Tris-buffered saline. Western blot analysis of ACE-2 was performed with anti-ACE-2 polyclonal antibody (1:200 dilution; Santa Cruz Biotechnology, Inc.). Bands were visualised by horseradish peroxidase (HRP)-conjugated donkey anti-goat secondary antibody (1:2000 dilution; Santa Cruz Biotechnology, Inc.) using the chemiluminescent substrate SuperSignal West Femto Maximum Sensitivity (Pierce, Rockford, IL, USA). To ensure equal loading of proteins, membranes were stripped and then reprobed with an antibody against β-actin (Cell Signaling Technology, Inc.). Protein was extracted from human biopsy samples or from mouse lung by homogenisation in ice-cold Tris-HCl EDTA-free buffer, pH 6.5 . The enzymatic activity of ACE-2 proteins was measured immediately after homogenisation by the cleavage of fluorogenic substrate MCA-YVADAPK at 10 μM, in 45 μL of lung tissue homogenate with Tris-HCl buffer pH 6.5 containing lisinopril (50 μg·L−1) to block ACE activity [4, 5]. Reactions were performed in black microtitre plates at room temperature in a fluorescence microplate reader (FL600 Biotec Fluorescence Reader; BMG, Durham, NC, USA) over 30 min, using excitation and emission wavelengths of 310/320 and 420/450 nm. Immunohistochemistry for ACE-2, type II cell-specific cytokeratins and PCNA was performed with anti-ACE-2 antibody (Abcam; 1:50 dilution), anticytokeratin antibody MNF-116 (Abcam; 1:50 dilution) and an anti-PCNA monoclonal antibody (BD Biosciences; 1:100 dilution). Deparaffinised lung sections were blocked with a solution of 3% bovine serum albumin in PBS for 1 h; the primary antibody was then applied overnight at 4°C in 3% bovine serum albumin/PBS. After washing in PBS, the antibody was detected with a biotin-conjugated secondary antibody and avidin-linked chromogen system. Chromogens were either diaminobenzidine (brown) or fast red (red). Immunohistochemistry was performed on ethanol-fixed AEC monolayers as described earlier , with fluorescein isothiocyanate (FITC)-conjugated anti-BrdU antibodies (BD Biosciences) or the same ACE-2 antibody used for western blotting. The prepared lung sections were photographed under transmitted or epifluorescent light on an Olympus BH2 epifluorescence microscope (Olympus Corporation, Tokyo, Japan) fitted with a SPOT Slider digital camera (SPOT Imaging Solutions, Sterling Heights, MI, USA). Images of green fluorescence (anti-ACE-2 or BrdU) were acquired through a 520-nm bandpass filter. Bivariate flow cytometric data for incorporated BrdU versus DNA distribution were performed as described earlier  on cells harvested by trypsinisation. Flow cytometric data were acquired on an Accuri C6 laser flow cytometer (BD Accuri Cytometers, Ann Arbor, MI, USA). For the aforementioned reasons, the levels of ACE-2 protein, enzymatic activity and mRNA were examined in the human and mouse AEC lines A549 and MLE-12 under proliferating versus quiescent culture conditions, both in the presence of growth factors. 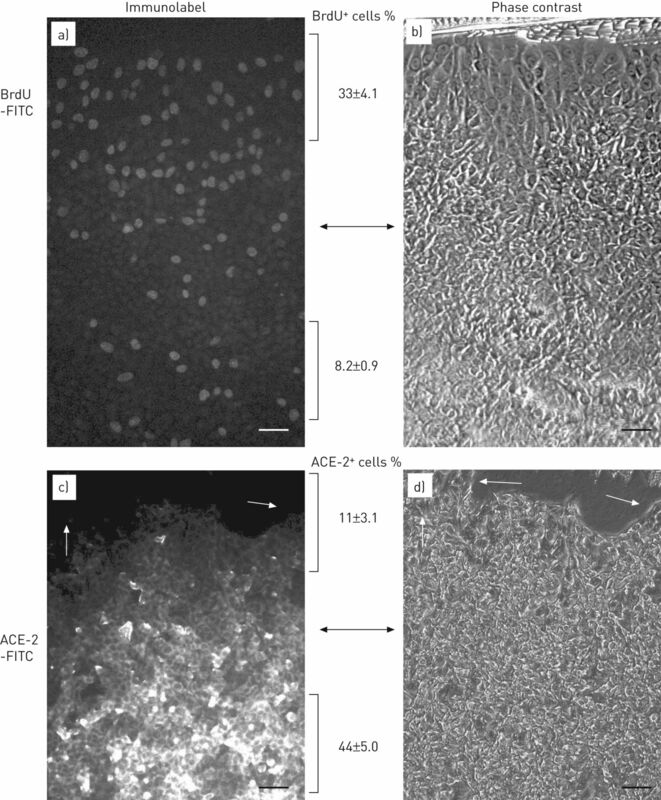 Figure 1a and b shows human alveolar epithelial A549 cells cultured under postconfluent and subconfluent culture conditions, respectively, both in the presence of growth factors (i.e. both in the presence of serum). Figure 1c shows BrdU labelling of S-phase cells that is quantitated in figure 1d and is increased significantly under subconfluent culture conditions. By fluorescence-activated cell sorter analysis (fig. 1e), the uniform distribution of BrdU-positive cells across early-, mid- or late-S-phase shows that the BrdU-positive cells are indeed undergoing replicative DNA synthesis under subconfluent culture conditions . Figure 1f demonstrates the decrease in BrdU-positive S-phase cells that accompanies the progression from log-phase growth in subconfluent culture to quiescence at postconfluent day 5. Similar results were observed in the cultured mouse AEC MLE-12 (data not shown). Manipulation of cell cycle status in cultured human lung epithelial cells. The human alveolar epithelial cell line A549 was cultured under subconfluent (SC) or postconfluent (PC) conditions, both in the presence of growth factors, as described in the Materials and Methods. a) Phase contrast micrograph of A549 cells at PC day 2; note the lack of binucleated or mitotic cells (compare to b). b) Phase contrast micrograph of SC A549 cells; note binucleated cells undergoing cytokinesis. c) Fluorescein isothiocyanate (FITC) bromodeoxyuridine (BrdU) labelling of S-phase A549 cells under SC culture conditions. d) Percentage of BrdU-positive nuclei under the culture conditions PC versus SC. Data are presented as the mean±sem of at least three cell cultures. *: p<0.05 versus PC by t-test. e) Bivariate flow cytometric analysis of DNA distribution (x-axis) versus incorporated BrdU (y-axis) of SC A549 cells; note the uniform distribution of BrdU-positive cells across S-phase DNA content . f) Quantitation of decreasing BrdU labelling of A549 cells during the progression from subconfluence to day 5 postconfluence. Data are presented as the mean±sem of at least three cell cultures. Scale bars=50 μm **: p<0.01 versus SC by ANOVA and Newman–Keul's test. See text for details. Figure 2 shows reductions in ACE-2 immunoreactive protein (fig. 2a), enzymatic activity (fig. 2b) and ACE-2 mRNA (fig. 2c) in human A549 cells and mouse MLE-12 cells cultured under proliferating (subconfluent) relative to quiescent (postconfluent day 5) conditions, both in the presence of growth factors. For each cell type, the enzymatic activity detected by fluorogenic peptide substrate (fig. 2b; see Methods) was essentially eliminated by the addition of peptide DX600, a competitive inhibitor of ACE-2 ; these data demonstrate specificity of the activity assay when performed as described here. In figure 2c, the mRNA for ACE-2 decreased to a degree similar to that observed for ACE-2 immunoreactive protein or enzymatic activity. In a different experimental approach, A549 cells cultured to postconfluent quiescent conditions (in the presence of serum) were subjected to experimental wounding (the in vitro “scratch” model) to induce cell proliferation immediately adjacent to the scratch. Figure 3 shows postconfluent A549 cells immunolabelled for BrdU (fig. 3a and b) or ACE-2 (fig. 3c and d) in a region immediately adjacent to a scratch (at the top of each panel) as well as further away (bottom of each panel). In figure 3a, cells at the edge of a scratch showed an increased BrdU labelling index (BrdU+ cells %)relative to cells distal to the scratch. Figure 3c and d revealed a reduction in ACE-2 immunoreactivity in the proliferating cells immediately along the scratch edge (white arrows, fig. 3c), which are clearly visible in a phase contrast image of the same microscopic field (fig. 3d, black arrows). Downregulation of angiotensin-converting enzyme (ACE)-2 protein, enzymatic activity and mRNA with proliferation of human and mouse alveolar epithelial cells in culture. The human and mouse alveolar epithelial cell lines, A549 and MLE-12, respectively, were cultured at postconfluent (PC) and subconfluent (SC) densities as described in the Materials and Methods and were then harvested for a) western blotting, b) ACE-2 enzyme assay or c) mRNA analysis by reverse transcriptase-PCR. a) A representative example of three similar blots from three separate experiments. b) Lysates from cells cultured under PC conditions were also assayed in the presence of peptide DX600 (DX), a competitive inhibitor of ACE-2. Note the essentially complete inhibition by DX (1 μM). Data are presented as the mean±sem of at least three cell cultures. *: p<0.05 versus PC; **: p<0.01 versus PC by ANOVA and Newman–Keul's test. Downregulation of angiotensin-converting enzyme (ACE)-2 immunoreactivity in human alveolar epithelial cells repairing a wound in vitro. The human cell line A549 was cultured to postconfluent density and subjected to wounding of the monolayer by scratch followed by a short exposure to bromodeoxyuridine (BrdU) (see Materials and Methods). Monolayers were then fixed and immunolabelled with fluorescein isothiocyanate (FITC)-conjugated antibodies against BrdU (a and b) or ACE-2 (c and d). Immunolabelling (a and c) and phase contrast (b and d) images of the same microscopic field are shown. In all, the scratch is at the top. Note the area of cells immediately adjacent to the scatch (d, black arrows) that are mostly negative for ACE-2 immunoreactivity (c, white arrows). Note also the increased density of BrdU-positive nuclei immediately adjacent to the scratch (a, upper quadrant) when compared with the density distal to the scratch (a, lower quadrant). Quantitation of BrdU-positive nuclei and ACE-2-positive cells at the edge of the scratch versus at the centre of the monolayer are indicated. Values are the mean±sem of at least three cell cultures; both BrdU-positive and ACE-2-positive values are significant to p<0.05 by t-test. Scale bars=50 μm. To determine if this inverse relationship between ACE-2 and epithelial cell proliferation might be detected in vivo in response to growth factor-induced proliferation of AECs, C57BL6 mice were instilled intratracheally with keratinocyte growth factor (KGF), a known epithelial-specific mitogen active on AECs [24, 25]. Figure 4 shows immunolabelling for ACE-2 (a, c and e) and BrdU (b and d), each performed on adjacent serial sections to ensure colocalisation within the same microenvironment. In normal mice (SHAM-instilled), ACE-2 immunolabelling was robust in epithelial cells within the alveolar corners (fig. 4a, brown), but BrdU immunolabelling in the same microenvironment was scant (fig. 4b). In contrast, KGF-instilled mice examined 2 days after intratracheal instillation displayed reduced ACE-2 immunolabelling (fig. 4c) in the same microenvironment where BrdU labelling was robust (fig. 4d). Figure 4e shows the return of robust ACE-2 immunolabelling at 2 weeks after KGF instillation, a time at which KGF-induced AEC proliferation has subsided . Figure 4f documents a significant reduction in total lung tissue ACE-2 enzyme activity 2 days after KGF instillation. Downregulation of angiotensin-converting enzyme (ACE)-2 in proliferating epithelia of mouse lung instilled with keratinocyte growth factor (KGF) in situ. C57BL6 mice were administered purified recombinant KGF or vehicle (SHAM) intratracheally. 1 h before sacrifice, animals were administered bromodeoxyuridine (BrdU; 50 mg·kg−1 i.p.) for identification of proliferating cells . Lung sections were immunolabelled with antibodies against ACE-2 (a, c and e) or BrdU (b and d). f) Lungs were homogenised for ACE-2 enzyme assay. Data are presented as the mean±sem of n=4 each for SHAM and KGF day 2. Scale bars=50 μm. FU: fluorescence units. *: p<0.05. See Materials and Methods for details. To determine if this inverse relationship between ACE-2 and epithelial cell proliferation might be detected in the intact human lung, biopsy specimens obtained from patients with IPF or normal human lung were subjected to immunohistochemistry for ACE-2, PCNA and a specific immunological marker of AECs (monoclonal antibody MNF-116 ). Figure 5 reveals that in normal human lung, immunoreactive ACE-2 was readily detected in epithelial cells within the alveolar corners (fig. 5a, brown), the normal location of type II pneumocytes. Immunohistochemistry for PCNA performed on a serial section of the same microenvironment revealed no proliferating epithelial cells (fig. 5b), consistent with the documented quiescence of type II pneumocytes in the normal, uninjured lung [19, 24]. In contrast, immunohistochemistry for ACE-2 performed on a lung biopsy obtained from an IPF patient (fig. 5c) revealed essentially no ACE-2 immunoreactivity in the alveolar epithelium of a microenvironment in which the epithelium was heavily labelled with PCNA (fig. 5d, arrowheads), as detected in an adjacent serial section. Figure 5e depicts immunohistochemistry for monoclonal antibody MNF-116 (brown) in a third adjacent serial section, to reveal that the epithelial layer was indeed being accessed by both the ACE-2 and PCNA antibodies. ACE-2-negative bronchial epithelia also were observed in IPF lung tissues (not shown). Downregulation of angiotensin-converting enzyme (ACE)-2 in proliferating epithelia of human idiopathic pulmonary fibrosis (IPF) lung in situ. 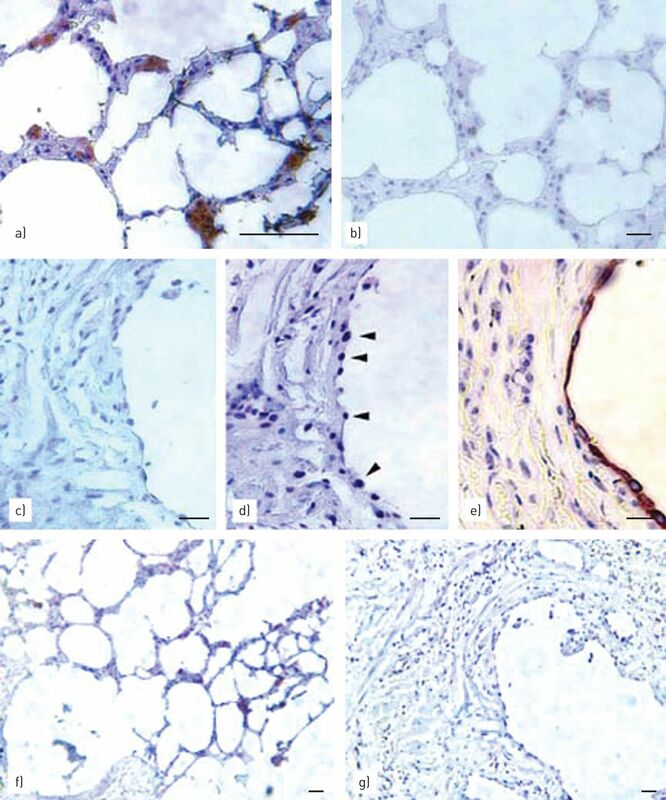 Paraffin sections of biopsy specimens of normal human lung (a and b) or IPF human lung (c, d, and e) were subjected to immunohistochemistry for ACE-2, proliferating cell nuclear antigen (PCNA) or MNF-116 as described in the Materials and Methods. a) Heavy labelling of ACE-2 (brown) in alveolar corner cells within normal human lung. b) Negative labelling of PCNA (contrast with d) in the same microenvironment of a serial section, adjacent to that analysed in a). c) Negative labelling for ACE-2 in epithelia of IPF human lung (contrast with a). d) Heavy labelling of PCNA (arrowheads) in the same epithelia of IPF lung (a serial section adjacent to that in c). e) Positive labelling by antibody MNF-116 (brown) in another serial section (adjacent to that in d) identifies the epithelial layer studied in c) and d). f) Low-magnification view of the same region from which a) was derived; brown: ACE-2-positive cells. g) Low-magnification view of the same region from which c) was derived. See Materials and Methods for details and descriptions of the patient populations. Scale bars=50 μm. In Figure 6, the culture system of subconfluent versus postconfluent human AECs was used to begin determining the mechanisms that might regulate ACE-2 expression as AECs transition from subconfluent, proliferating cells to quiescent, postconfluent cells. Figure 6a shows that human A549 cells in subconfluent proliferating cultures (with relatively little ACE-2) gradually accumulate more immunoreactive ACE-2 with each day in postconfluent culture. With increasing time in postconfluent culture, cell proliferation (assessed by BrdU labelling) gradually decreased to the 5-day postconfluent value shown in figure 1b (BrdU time-course not shown). Figure 6b shows that the transcription inhibitor actinomycin D, if added to the culture medium on either postconfluence day 4 or postconfluence day 1, could partially or completely block, respectively, the accumulation of immunoreactive ACE-2 protein that would otherwise occur by day 5 postconfluence. Figure 6c shows that SP600125, an inhibitor of JNK, could inhibit the accumulation of ACE-2 in A549 cells if added to culture medium on the first of 5 days in postconfluent culture. In contrast, inhibitors of extracellular signal-regulated kinases (ERKs) or p38-mediated signalling had no inhibitory effect on ACE-2 accumulation. These data suggest that the increase in ACE-2 that occurs as AECs transition from proliferating to quiescent cultures is regulated by a transcriptional mechanism mediated by JNK. Evidence for c-Jun N-terminal kinase (JNK)-mediated transcriptional control of angiotensin-converting enzyme (ACE)-2 upregulation in the epithelial transition from cell cycling to quiescence. The human cell line A549 was cultured at subconfluent density and monitored daily by western blotting during the transition to postconfluent quiescence, either in the presence or absence of actinomycin D (Act), vehicle (0.1% DMSO in F12 media; D) or inhibitors of JNK (JNKi), ERKs (ERKi) or p38 (p38i)-mediated signalling pathways. See Materials and Methods for details; all panels show a representative example of at least three similar blots from three separate experiments. a) Increase in immunoreactive ACE-2 as a function of time (days) in postconfluent (PC) culture relative to subconfluent (SC) cultures. b) Blockage of ACE-2 upregulation over 5 days’ PC culture (PC5) of A549 cells by the addition of actinomycin D (1 μg·mL−1) on postconfluence day 4 (Act4) or postconfluence day 1 (Act1). Note the similarity of ACE-2 expression under Act1 conditions to that observed in SC culture (in a). c) Blockage of ACE-2 upregulation over 5 days’ PC culture of A549 cells by the addition of SP600125 (10 μM) on postconfluence day 1 (JNKi-1), but not by inhibitors of ERKs (PD98059, 10 μM) or p38 (SB203580, 10 μM) applied in the same manner. To our knowledge, this is the first report of regulation of ACE-2 expression as a function of cell cycle in any cell type or organ. In general, the control of ACE-2 expression is poorly understood. In cardiac myocytes and fibroblasts, ACE-2 mRNA and protein are downregulated by ANGII or endothelin (ET)-1 and upregulated by the ANG receptor AT1 blocker losartan . The effects of either ANGII or ET-1 were prevented by inhibitors of mitogen-activated protein kinase-1, suggesting that the effects of these peptides might by mediated by ERKs. ANG1-7, one of the products of ACE-2 degradation of ANGII, also inhibited the decrease in ACE-2 mRNA in response to either ANGII or ET-1 through the ANG1-7 receptor mas. In the mouse lung, ACE-2 has been shown to be developmentally regulated, with mRNA highest at embryonic day 18.5, and to be expressed primarily in bronchiolar and alveolar epithelial cells . In the human lung, airway epithelial cells are one of the first sites of contact by the SARS coronavirus during lung infection; moreover, ACE-2 has been shown to be the site to which the SARS virus binds to initiate tissue infection . In studies of cultured human airway epithelial cells, shedding of the ACE-2 ectodomain is believed to be an important determinant of the extent and outcome of SARS infection . Related in vitro investigations have shown that shedding of the ACE-2 ectodomain is upregulated by phorbol esters and, furthermore, is dependent on the binding of calmodulin to a specific binding domain in the cytoplasmic tail of ACE-2 . Although shedding of ACE-2 is believed to be important in SARS infection, the impact of either of these mechanistic determinants of ACE-2 ectodomain shedding, if any, on the physiological roles of pulmonary ACE-2 in the absence of SARS infection is currently unknown. In cultured human pulmonary artery smooth muscle cells exposed to hypoxia in vitro, ACE-2 mRNA and protein were transiently upregulated in a manner dependent on the transcription factor hypoxia-inducible factor-1α . However, ACE-2 was downregulated in these cells by ANGII in a manner inhibitable by antagonists of the AT1 receptor but not by AT2 receptor antagonists. Beyond these two studies, little is known about the factors that regulate ACE-2 gene expression in lung cells. Although the works mentioned above suggest that ACE-2 levels in AECs might be responsive to changes in the steady state levels of ANGII or ANG1-7 (i.e. a feedback loop) independent of cell proliferation, the addition of the ACE-2 inhibitor DX600  during the progression from subconfluent to 5-day postconfluent cultures (as in fig. 6) had no apparent effect on the accumulation of ACE-2 (data not shown). The data reported herein strongly support the hypothesis that ACE-2 expression in AECs is regulated in a cell cycle-dependent manner, since ACE-2 mRNA, protein and enzymatic activity were all reduced in proliferating AECs relative to quiescent cells in postconfluent culture. Although the fluorogenic peptide substrate used here, and elsewhere, to measure ACE-2 is known to also function as a substrate for ACE-1, interleukin-1β-converting enzyme and other peptidases , the elimination of ACE-2 activity by the addition of the competitive ACE-2 inhibitor peptide DX600 (fig. 2) supports our contention that the ACE-2 assay conditions used here yield measurements that are specific for ACE-2. Similarly, the findings of reduced or absent ACE-2 immunoreactivity in A549 cells immediately adjacent to an in vitro wound (fig. 4) or within regions of fibrotic human lung with robust epithelial cell proliferation (fig. 5) argue against the contribution of cell culture artefacts to the substantial differences in ACE-2 expression observed in proliferating versus postconfluent AEC cultures. On this basis, it is hypothesised that the cell culture model of proliferating versus postconfluent AEC lines, described herein, offers a viable experimental system with which to begin exploring the molecular mechanisms underlying the regulation of ACE-2 expression in a cell cycle-dependent manner. Our initial study of the mechanisms that underlie the upregulation of ACE-2 as cultured AECs enter quiescence (fig. 6) is consistent with the working hypothesis that ACE-2 gene transcription is increased by exit from the cell cycle through a JNK-mediated mechanism. Attempts to identify transcription factors and JNK-dependent signalling pathways active in this process are currently underway. The potential physiological significance of such a cell cycle-dependent regulatory scheme for ACE-2 is currently unknown, but might be rationalised in the context of current thinking about the alveolar epithelium in human lung fibrosis. The classical observations of “hyperplastic” or “cuboidal” alveolar epithelia in fibrotic human lung are consistent with the long-held view that ongoing injury to the epithelium stimulates an attempt to repair epithelial damage through type II pneumocyte proliferation [18, 19, 32]. Although myofibroblast foci underlying the abnormal epithelium in IPF are thought to influence epithelial cell survival [3, 13], downregulation of ACE-2 in the IPF lung biopsies studied here did not appear to be spatially related to the presence or absence of myofibroblast foci (data not shown). The failure of the epithelium to completely repair and replace the normal type II and type I cell populations, which was once thought to be primarily a result of disregulated proliferation or differentiation , is now known to be complicated by the consistent observation of epithelial apoptosis in the same microenvironment as AEC proliferation [3, 34, 35]. These two observations, although seemingly paradoxical, make sense when considered in the light of current knowledge regarding the signalling of cell division and cell death; in the control of either cell proliferation or apoptosis, cell cycle progression is required for both initial signalling and execution . Moreover, recent studies demonstrated a critical role for the angiotensin system and in particular, ACE-2, its product ANG1-7 and JNK, in modulating the apoptotic response of AECs . Indeed, both human lung myofibroblasts and apoptotic AECs have been shown to synthesise and secrete ANGII in vitro [9, 10, 13] and to express ANG peptides in the fibrotic human lung . Given the finding that ACE-2 is downregulated by ANGII in a manner inhibitable by ANG1-7 in cardiac myocytes and fibroblasts , it will be of great interest to examine the possibility that these same ANG peptides might play a regulatory role in the downregulation of ACE-2 gene expression in a cell cycle-dependent manner in the alveolar epithelium in human lung fibrosis. In that regard, several authors have performed retrospective analyses of the incidental use of ACE inhibitors in patients with IPF and reported no beneficial effect . However, as discussed recently by Budinger , the conclusion that these studies argue against a profibrotic role for ANGII in human lung fibrosis fails to acknowledge the demonstrated antifibrotic roles of the ACE-2 product ANG1-7 [5, 16], which would be reduced by ACE inhibitor administration. For these reasons, angiotensin receptor blockers, but not ACE inhibitors, are currently of high interest in ongoing clinical trials designed for IPF patients . Support statement: This work was supported by PHS HL-45136 and by American Heart Association Grant-In-Aid 0950045G (to B.D. Uhal), and by grants from IDIBELL, Spain (to M. Molina-Molina).
. Essential roles for angiotensin receptor AT1a in bleomycin-induced apoptosis and lung fibrosis in mice. Am J Pathol 2003; 163: 2523–2530.
. Attenuation of bleomycin-induced pulmonary fibrosis by intratracheal administration of antisense oligonucleotides against angiotensinogen mRNA. Curr Pharm Design 2007; 13: 1257–1268.
. Extravascular sources of lung angiotensin peptide synthesis in idiopathic pulmonary fibrosis. Am J Physiol Lung Cell Mol Physiol 2006; 291: L887–L895.
. Angiotensin converting enzyme-2 is protective but downregulated in human and experimental lung fibrosis. Am J Physiol Lung Cell Mol Physiol 2008; 295: L178–L185.
. Regulation of alveolar epithelial cell survival by the ACE-2/angiotensin1-7/Mas axis. Am J Physiol Lung Cell Mol Physiol 2011; 301: L269–L274.
. Angiotensin II is mitogenic for human lung fibroblasts via activation of the type 1 receptor. Am J Respir Crit Care Med 2000; 161: 1999–2004.
. The angiotensin II receptor 2 is expressed and mediates angiotensin II signaling in lung fibrosis. Am J Respir Cell Mol Biol 2007; 37: 640–650.
. Angiotensin II and the fibroproliferative response to acute lung injury. Am J Physiol Lung Cell Mol Physiol 2004; 286: L156–L164.
. Fas-induced apoptosis of alveolar epithelial cells requires ANG II generation and receptor interaction. Am J Physiol 1999; 277: L1245–L1250.
. Apoptosis of lung epithelial cells in response to TNF-α requires angiotensin II generation de novo. J Cell Physiol 2000; 185: 253–259.
. Bleomycin-induced apoptosis of alveolar epithelial cells requires angiotensin synthesis de novo. Am J Physiol Lung Cell Mol Physiol 2003; 284: L501–L507.
. Inhibition of amiodarone-induced lung fibrosis but not alveolitis by angiotensin system antagonists. Pharmacol Toxicol 2003; 92: 81–87.
. Angiotensin-TGF-β1 crosstalk in human idiopathic pulmonary fibrosis: autocrine mechanisms in myofibroblasts and macrophages. Curr Pharm Des 2007; 13: 1247–1256.
. JunD and HIF-1α mediate transcriptional activation of angiotensinogen by TGF-β1 in human lung fibroblasts. FASEB J 2009; 23: 1655–1662.
. Reduction of bleomycin induced lung fibrosis by candesartan cilexetil, an angiotensin II type 1 receptor antagonist. Thorax 2004; 59: 31–38.
. 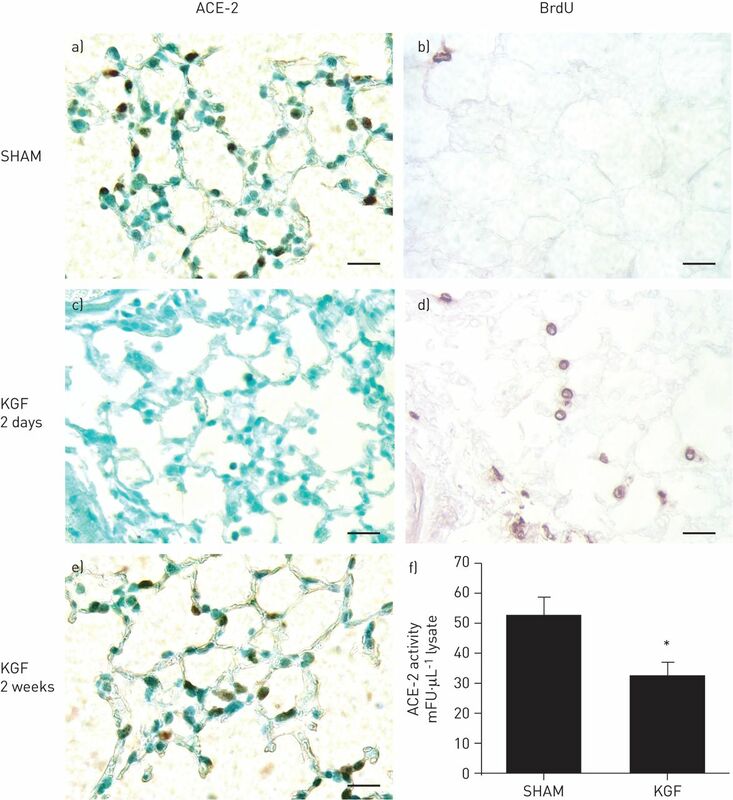 The angiotensin-converting enzyme 2/angiogenesis-(1–7)/Mas axis confers cardiopulmonary protection against lung fibrosis and pulmonary hypertension. Am J Respir Crit Care Med 2010; 182: 1065–1072.
. Responses of the lung to toxic injury. Environ Health Perspect 1990; 85: 5–13.
. Pulmonary fibrosis: human and experimental disease. In: Rojkind M , ed. Connective Tissue in Health and Disease. Boca Raton, CRC Press Inc., 1990; pp. 123–188.
. Cell cycle kinetics in the alveolar epithelium. Am J Physiol 1997; 272: L1031–L1045.
. Type II pneumocyte proliferation in vitro: problems and future directions. Am J Physiol 1991; 261: Suppl. 4, 110–117.
. DNA distribution analysis of type II pneumocytes by laser flow cytometry: technical considerations. Am J Physiol 1991; 261: L296–L306.
. Novel peptide inhibitors of angiotensin-converting enzyme 2. J Biol Chem 2003; 278: 15532–15540.
. Alveolar epithelial type II cell: defender of the alveolus revisited. Respir Res 2001; 2: 33–46.
. Novel therapeutic approaches for pulmonary fibrosis. Br J Pharmacol 2011; 163: 141–172.
. Regulation of ACE2 in cardiac myocytes and fibroblasts. Am J Physiol Heart Circ Physiol 2008; 295: H2373–H2379.
. Angiotensin converting enzyme 2 is primarily epithelial and is developmentally regulated in the mouse lung. J Cell Biochem 2007; 101: 1278–1291.
. Angiotensin-converting enzyme 2 is a functional receptor for the SARS coronavirus. Nature 2003; 426: 450–454.
. Ectodomain shedding of angiotensin converting enzyme 2 in human airway epithelia. Am J Physiol Lung Cell Mol Physiol 2009; 297: L84–L96.
. The identification of a calmodulin-binding domain within the cytoplasmic tail of angiotensin-converting enzyme-2. Endocrinology 2009; 150: 2376–2381.
. Role of HIF-1α in the regulation ACE and ACE2 expression in hypoxic human pulmonary artery smooth muscle cells. Am J Physiol Lung Cell Mol Physiol 2009; 297: L631–L640.
. Pulmonary fibrosis – a possible mechanism. Toxicol Appl Pharmacol 1979; 51: 475–487.
. Alveolar epithelial cells in pulmonary fibrosis. In: Phan SH, Thrall RS , eds. Pulmonary Fibrosis. London, Informa Healthcare, 1995; pp. 511–540.
. Alveolar epithelial cell death adjacent to underlying myofibroblasts in advanced fibrotic human lung. Am J Physiol 1998; 275: L1192–L1199.
. Expression of apoptotic and antiapoptotic markers in epithelial cells in idiopathic pulmonary fibrosis. Chest 2005; 127: 266–274.
. Apoptosis: a product of programmed and unprogrammed cell death. Toxicol Appl Pharmacol 1993; 121: 160–164.
. Impact of angiotensin-converting enzyme inhibitors and statins on survival in idiopathic pulmonary fibrosis. Chest 2004; 126: 438–446.
. Angiotensin II and pulmonary fibrosis, a new twist on an old story. Am J Physiol Lung Cell Mol Physiol 2011; 301: L267–L268.